Provide an opportunity for children and adults with physical and intellectual disabilities to play baseball at a facility that meets the unique needs of the players and their families. ...... Hope, Determination and a display of Human Spirit that is unequaled. And of course there is baseball. There is something about playing the game that lights up a youngster's eyes. But for children with serious physical and intellectual disabilities that opportunity can often be difficult to achieve. Baseball diamonds were not exactly designed with wheelchairs, walkers and crutches in mind. 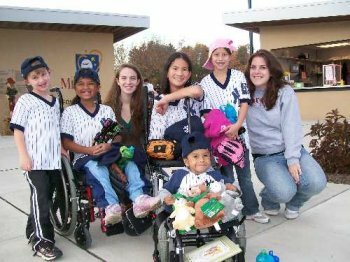 The Miracle League removes the barriers that keep children with disabilities off the baseball field and lets them experience the joy of America's favorite pastime. 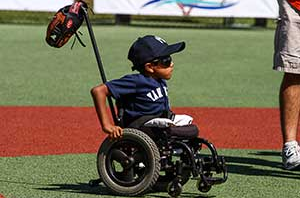 Since the barrier for these children arise from the natural grass fields used in conventional youth league, Miracle League teams play on a custom designed field with a rubberized surface that accommodates wheelchairs and other assisting devices while helping to prevent injuries. But it's more than playing a game. It is about making new friends, building self-esteem and being just like other kids. America has a rich sports history but no sport is more intricately woven into our nations fabric than baseball. Baseball's roots goes back to 1845 when the first recorded game was played in New Jersey. One hundred and sixty five years later baseball remains "America's pastime." Many of us grew up we played baseball or softball. We played in organized leagues or pick-up games in the "sand lots." We ran in the grass outfield to catch a fly ball and darted across the base paths trying to "touch them all." What an exhilarating feeling that was! Now try to think of yourself in a wheelchair or walker trying to create that same feeling on a dirt and grass field that you cannot play on. There are many children and adults with physical and intellectual disabilities who cannot enjoy the game because of the barriers a normal field presents. There are thousands of children in greater Northampton County who are not disabled who enjoy the game on fields in every community. However, there is not one field in the county that is designed for a child and adults with disabilities. Ten years ago the first Miracle League field was built in Conyer, GA and today there are 250 in the nation and growing. The nearest field is the Miracle League of the Lehigh Valley located in northern Lehigh County. It is time to build this type of field in Northampton County. In a letter to the editor in one of the local newspapers a resident of Northampton County questioned the use of latex in Surface America's EverTop surface which is the field surface choice for the Miracle League field being built. The surface to be applied is 100% latex free. Surface America and the surface type are approved by the National Headquarters of the Miracle League. Since the beginning of this project we have worked with the Miracle League Headquarters to be sure that we follow all of their specifications for the safety of the children who will be enjoying the experience of playing baseball on this field. On July 28, 2011 we built the Board of Directors two people joined who really did not know each other and now they are the best of friends. 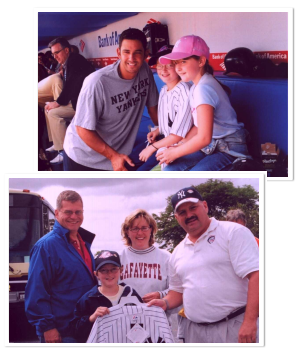 Chuck Frantz is the president of the Lehigh Valley New York Yankees Fan Club and John Lahutsky, a graduate of Freedom High School, was also a devoted Yankees fan. In most situations this would have been a bond created by being fans of the same baseball team. However, John was brought up much differently than the rest of us on the board. From the age of 18 months to the age of 9 years John spent his life in a Russian orphanage and asylum simply because he was born with cerebral palsy. John coauthored a book with Alan Philps titled "The Boy From Baby House 10" that told his story of the in-humane conditions in the Russian orphanage and asylum system that he went through in the development years of his life. That in-humane treatment stopped when he was adopted 12 years ago by his mom, Paula Lahutsky. From the time that Chuck Frantz first met John a strong bond occurred. 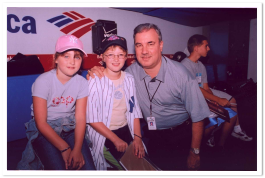 Not because both of them were Yankee fans but because Chuck is a special person. As a result, Chuck, working with the Yankees organization as they developed plans for this year's HOPE week, was able to bring John's story to their attention. The Yankee organization embraced John's story and made him one of the honorees of HOPE week. 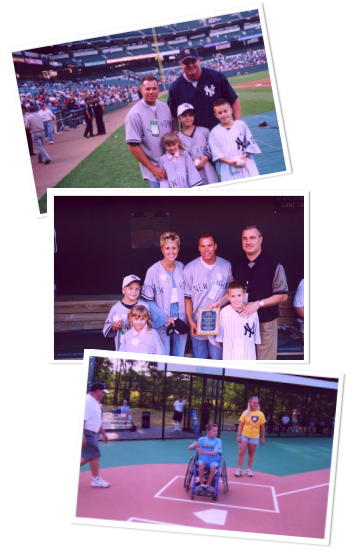 As part of the activities the Yankee organization arranged a reunion between John and Andrei Sullivan, his best friend at the orphanage who he had not seen since Andrei was adopted 14 years ago. At the Yankee game that evening John and Andrei threw out the first pitch. As part of honoring of John the Yankees presented him with a check for $10,000 to be given to the charity of his choice. John has chosen the Miracle League of Northampton County as his charity. 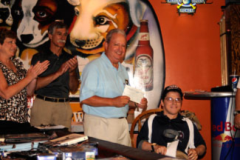 In the picture MLNC President Ric Agretto accepts the check from John. Other board members attending the event are Bob Pruznick, Debbie Young (in the picture), and Bob Lammi. The Board of Directors thanks the Yankees and John for this generous donation. We also thank one of our own, Chuck Frantz, for being the type of guy that the Miracle League is all about. ROAD. FOLLOW APROX. 0.2 MILE, MAKE LEFT ONTO NULTON AVE. TURN RIGHT AND FOLLOW GREENWOOD AVE FOR A SHORT DISTANCE AND BEAR LEFT ONTO GREEN POND RD. Zach's story speaks of courage, generosity, determination and a love for life. His favorite picture is the one of him in his boxing clothes; as he says, "I'm not going to give up the fight". Zach was six years old when he was diagnosed with Acute Lymphocyte Leukemia. Now 13, Zach continues to fight the disease and its side effects. Hospital for Children in Philadelphia, he saw a need for distraction and entertainment in the oncology unit. Zach went door-to-door and raised over $11,000 to buy toys, games and other playthings for the unit. Over the past five years many organizations have held fundraisers to assist with Zach's medical expenses; he always asks to split or donate the entire proceeds to another family he knows is having hard times. "He has always been able to see past himself to help others," says his mother, Tamara. On August 1, 2003, Zach's little sister gave him his gift of life - her bone marrow. This was expected to be the last chapter of the family's journey, but that was not to be. Zach now suffers a side effect of the transplant called Graft vs. Host Disease which has attacked many parts of his body.He now needs surgery on both his legs to get the pain under control. Also the drugs he needs in the future are experimental and not covered by insurance. Zach still has a long battle ahead of him but takes each day one at a time. Zach lost his long battle with Acute Lymphocyte Leukemia he passed away in February of 2011. Our thoughts and prayers are with and his family. We will miss you Zach. The McGovern family is composed of seven children through birth and adoption, as well as one or two children who come to stay with them while they receive medical treatment. child who just needed a weekend respite home when she was 1 month old, because her foster family was going away for the weekend. One and a half months later, she came to stay! Hannah had a very rough start to life, and it was compounded by many food allergies which she continues to battle now. But Hannah is known to have a beautiful singing voice and an impish gleam in her eyes! Taiwan.. She was born missing all of two limbs and half of another. Brianna is often caught with her big dimple setting off her even bigger smile. She is also known to have a need for speed, and is often "ticketed" for driving her wheelchair too fast! has the greatest joy for life and each day he wakes with a smile and a story. Eric joined the McGovern family in the fall of 2006 from CA where he was a foster child for his first 2 3/4 years of his life. Eric's spine was not fully formed and because of that , his legs were contracted without the ability to straighten them. His internal organs are somewhat compressed because he doesn't have the spine to help him to grow tall. He had his lower legs amputated in October of 2007. Eric has a contagious personality and everyone he meets falls in love with him. He is cuddly and sweet and naughty and beautiful, all rolled up into one 18 pound little boy! music. Each child is active and social, and although two of them use wheelchairs in public, they scoot all over the house at home. They play, they laugh, they fight, they mess up their rooms (and then have to clean them) like any other group of siblings. We are very blessed! cause. To date, Kasey's Krusaders have raised over $97,000 for the society over the course of 5 Light the Night Walks and two celebrity and sports memorabilia auctions they have hosted. As of February 2008, Kasey has been off chemotherapy for two years and continues to amaze people with her good health and attitude. Kasey is a three season athlete playing field hockey, basketball and softball and enjoying all that life has to offer. She is a die-hard New York Yankee and Philadelphia Eagles fan who has a great memory for sports stats, trivia and general player knowledge.